I have been looking for a good Weight Watchers breakfast ideas, and never even considered oatmeal to be a choice. I have been anti-oatmeal since I was a little girl. I remember my Sister loved instant oatmeal, and I always tried to like it because it smelled so good, but it just didn’t taste right. As an adult, I have tried various kinds and always found the same problem. Between texture and overall flavor, I just didn’t like it. That is until I started making steel cut oatmeal for my Beau. As I was creating various flavor combinations, I would test to make sure I had it right. Lo and behold, I found that I actually liked the texture of steel cut oatmeal. 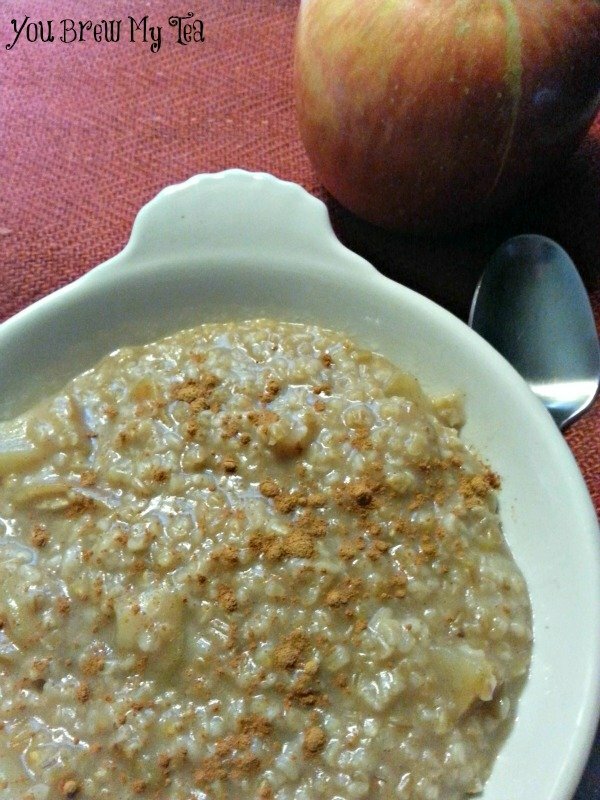 This Weight Watchers Apple Cinnamon Steel Cut Oatmeal is now in our regular breakfast rotation, and I gladly eat it too! I love this Weight Watchers oatmeal breakfast because it not only tastes delicious, it is really satisfying. With the addition of fresh or dehydrated apples to the oatmeal, I find it hearty enough to eat a smaller portion. It sticks with me until my morning snack (usually Greek yogurt or fresh fruit). Not only is it easy to make on the stove top, you can easily put this into your Crockpot on low and make a big batch to portion out later! The Wee Child hasn’t quite gotten into the habit of eating steel cut oatmeal, but he likes this one because of the flavor. It can be tough finding a Weight Watchers breakfast or Weight Watchers oatmeal that everyone in the house will love, but this one does the trick. We typically sweeten with honey, but you can easily use maple syrup or black strap molasses instead. Whatever your preference, this recipe is simple to adapt. In a medium saucepan, bring water, milk, honey, and vanilla to a boil. Mix in apples and oatmeal and stir well. Turn to medium heat and allow to simmer for 10 minutes, stirring occasionally to prevent sticking. Add the cinnamon and salt. Continue cooking for 3-5 minutes. If cooking in Crockpot, spray Crockpot with a non-stick spray and pour all ingredients into the crock mixing well. Cook on low for 1½-2 hours or until desired consistency. Since this Weight Watchers oatmeal takes a little bit longer to cook than the common quick cut oats, you may prefer the simple Crockpot directions listed above. Additionally, cooking larger batches and portioning to freeze is a great idea. This apple cinnamon steel cut oatmeal reheats quickly in the microwave and retains it’s texture well from freezer to microwave to table. 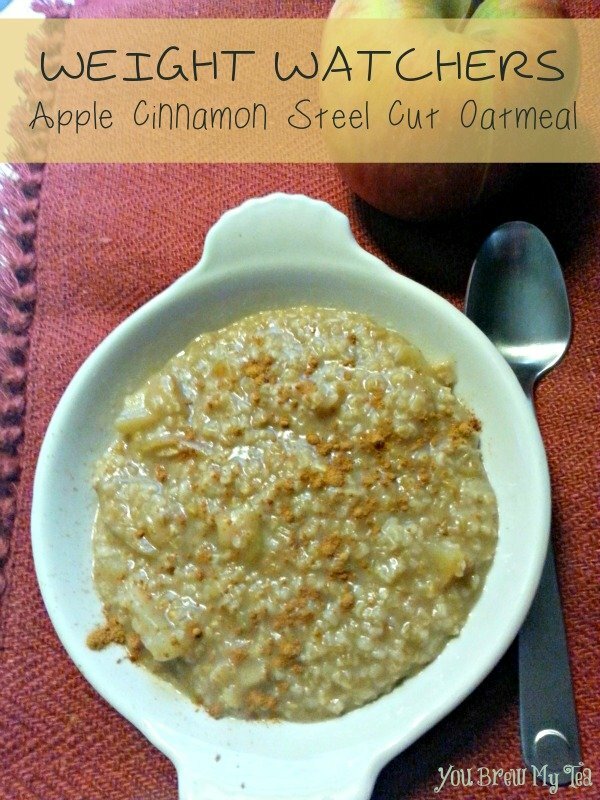 For a non-oatmeal fan, this Weight Watchers Apple Cinnamon Steel Cut Oatmeal is a great breakfast. It is also a wonderful treat for dessert, or depending on your calorie or point allowance, it can make a great snack too! Be sure to check out all of our favorite Weight Watchers Recipes! This sounds delicious! I haven’t made steel cut oats in a long time, but this looks like something I need to make soon. Pinned it to my Breakfast board. I’d love for you to share this recipe at my Creative Ways Link Party. It goes live at 8pm central tonight. Hope to see you there! Thank you so much for attending week 3 of #PureBlogLove and linking your fantastic blog post, I can’t wait to see what you have in store for our party next week Thursday 8 PM EST- Sundays at midnight . Have a great day! That sounds so good! Thank you for linking up! Thank you for joining us last Thursday night for #PureBlogLove Link Party on http://www.themccallumsshamrockpatch.com , we hope you will join us tonight or this weekend for week 4 (Thursdays @8pm- Sundays at midnight) Loved your blog post and look forward to seeing you again this weeeknd! Can you post the nutritional value for this please? Cut back on water next time if cooking on the stove top. Way to much liquid for only 1/2 cup of oats. Had to cook a LONG time to cook it down. Are you using steel cut oats or rolled oats? This recipe is for steel cut oats and they require more liquid.